A strategy game with RPG elements, in which you manage a fortress of the eponymous Assassin Brotherhood and lead a self-composed team of assassins. The title was developed by the Canadian team at Behavior Interactive Studio. Assassin’s Creed Rebellion is a strategy game with RPG elements developed by a Canadian team at Behavior Interactive Studio in association with Ubisoft. The title was designed for mobile platforms (including AND and iOS), and is distributed in a free-to-play free model. Assassin’s Creed Rebellion is set in the 15th-century Spain, where the eponymous Assassins are fighting the Inquisition. The Brotherhood is represented by more than forty characters, including not only characters known from Assassin’s Creed video games (Ezio, Shao Jun, Machiavelli) and the movie (Aguilar), but also twenty completely new individuals. The core gameplay in Assassin’s Creed Rebellion is managing the fortress – gaining new progression levels allows you to expand it by new areas, and equipping it with better items. The fortress is the main base of operation for your men, from where they set out for missions in teams of up to three members. Missions are divided into four categories: while Story and Legacy tasks allow you to obtain DNA fragments, needed to unlock more Assassins, Standard missions grant you raw materials (for upgrading individual units), and the ones from the Loot category provide resources needed to create increasingly better equipment using the extensive crafting system. It is worth noting that the fullfilment of a particular goal requires you to send a character with specific abilities – the makeup of the team determines the course of the mission. Assassin’s Creed Rebellion’s 3D graphics on AND and iOS is fairly decent. This title stands out from other games in the series because of its original cartoon graphics style. 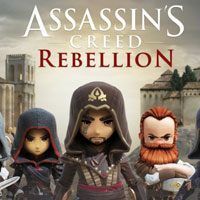 Guide to Assassin's Creed Rebellion is a collection of tips for this mobile edition of famous series. The guide is intended for beginners - starting tips will help to expand the base, create a team or craft weapons and armor.